If you’re visiting Paris, you’ll probably want to save a day for a side trip to Champagne. A day trip from Paris to Reims is actually very easy and quick via train. The TGV train will get you there in 45 minutes and you’ll have the rest of the day to enjoy the bubbles of a few Champagne tours in Reims (the center of the Champagne world in France). 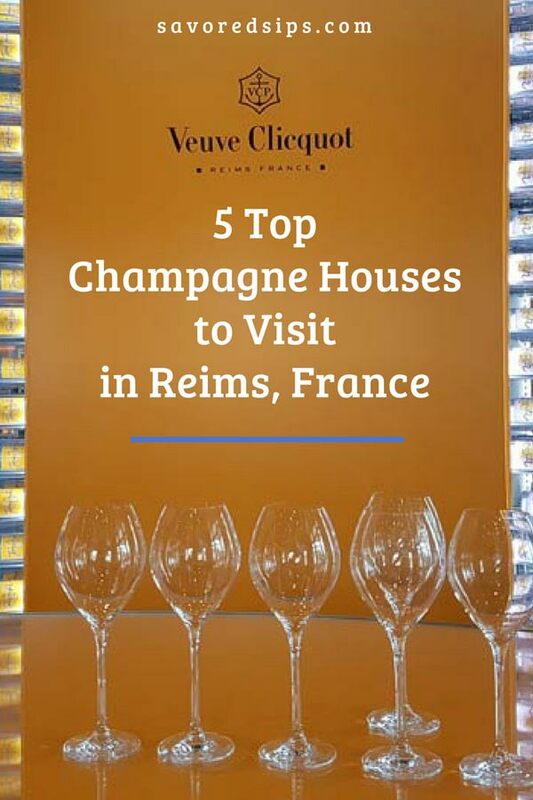 In Reims, you can visit world-famous estates, such as Veuve Clicquot, Pommery, and Taittinger, or check out the smaller houses you may not have heard of. All you’ll need are a few advanced appointments, your walking shoes (or a quick Uber ride), and enough time to do it justice. Below you’ll find all you need to know about taking a day trip to Reims for Champagne tours and tasting. Let’s first get the logistics out of the way. You can get to Reims from Paris by taking the TGV train. From anywhere in Paris, just get yourself to the East Railway Station. You can take the Paris subway to arrive at this station. This makes it very easy to visit Reims, no matter where in Europe you’re arriving from. You don’t have to have tickets for the train in advance, but during busy times we do recommend buying them in advance to make sure you can get a seat. There have been times that the train has been full and we’ve had to take the next one. You can purchase tickets in advance on Trainline.com. The train journey to Reims is only about 45 minutes. If you plan to go to Epernay – another of the nearby major Champagne cities – you can continue on from Reims on the TER train, which departs every 30 minutes and takes around 40 minutes to get there. Walk: It’s actually quite easy to walk around Reims. The biggest hurtle is getting from the train station (or center of Reims) to the area where you find most of the Champagne houses. This is about a 2 mile walk (40 mins). If you don’t want to take this initial walk, you can take a quick Uber or taxi ride from the train station. We recommend starting at Veuve Clicquot, as it’s the furthest way from town (2 miles). To walk between any of the 5 Champagne houses mentioned, it will take you about 5 minutes or less. Uber or Taxi: If you can’t or don’t want to walk, you can take an uber or taxi from the train station to any of the Champagne houses. Once you’re ready to go on to the next, you can call another Uber or taxi to take you there. Rent a car: There is a convenient place near the train station to rent a car for the day. In fact, it’s just a few steps outside the door to the train station. It’ll cost around 40€ to rent a car for a day. We recommend using Expedia to book your rental car. If you’re staying overnight in Reims, you’ll quickly learn that there isn’t a huge selection of hotels. We stayed at Best Western Premier Hotel de la Paix. If you’re looking for a more luxury stay, try the Chateau Les Crayeres. ⇒ Be sure to check out our list of the drinks you should try in France. There’s so much more to enjoy beyond the Champagne. See the map below for directions to your Reims Champagne tours. You’ve likely already heard of this Champagne brand, as it’s one of the most popular Champagnes being sold around the world. In case you’re thinking that means it’s not worth a visit to this Champagne house because it will be too touristy, we don’t think that’s an issue. In fact, this was one of our favorite Champagne tours in Reims. The underground cellars of Veuve Clicquot might be one of the main reasons we love it here so much. The cellars are classified as a UNESCO World Heritage sight. That’s not surprising when you learn that they’ve been making wine since 1772. In 1909, they bought these old underground quarrys to store their wine. There is some fascinating history in these caves, which you’ll learn all about during the tour. After the tour of the cellar and facilities, you’ll have a chance to try the Champagne. There are a few different tickets you can purchase. Click here to see them all and book online. Discovery Tour – 26€: 45min tour followed by a single tasting of Yellow Label Brut 26€. This tour is available Tuesday to Saturday. On the Footsteps of Madame Clicquot – 53€: 1 hr tour where you’ll learn all about Madame Clicquot, followed by a tasting of the Brut Yellow Label and prestige Cuvée La Grande Dame. Veuve Clicquot & Rose Champagne – 40€: In 1818, Madame Clicquot was the first to make a rose champagne blend, which changed the landscape of Champagne for ever. Learn all about the Rose on this 45 min tour, followed by a tasting. The Pommery Elizabethan-style estate was built in the 19th century by the lady of the house, Jeanne Pommery. It is one of the most archtecturally stunning estates you can visit today. Pommery is also one of the biggest Champagne house today, producing over 500,000 cases of Champagne a year. You’ll definitely want to stop here for a tour to see the ancient Roman caves and art nouveau tasting rooms. The chalk cave cellars are equally impressive, and can be access from an incredible staircase worth seeing – it’s 116 steps down to the cellars! Your tour will end with a tasting of one of the famous Pommery Champagnes. There are various tours you can take at Pommery. Be sure to book in advance. The tours are given in English, French, and German. “Art of Champagne” Caves – 22€-30€: 1 hour tour of the Gallo-Roman chalk cellars, with explanations of the history, wine development of Pommery, plus a visit to the contemporary art exhibit, followed by a tasting. Choice of 1 glass for 22€, cuvee experience for 26€ or 2 glasses for 30€. Henry Vasnier’s Dream – 35€ 90 minute tour that follows the dream of Henry Vasnier, right arm man to Mrs. Pommery and patron of the City of Reims. Includes a visit of the Pommery Cellars and the Villa Demoiselle. Includes a 2-glass tasting. The impressive entrance gates set the scene of this classic Champagne House. Make sure you have your cameras ready because it doesn’t stop there. The tour starts with an informative video of the history of Taittinger and it’s Champagne-making style. You’ll then get to go down inside the impressive 4th century chalk mines, which have recently been designated a UNESCO World Heritage Site. You’ll walk through the remnants of the old Saint Nicaise Abbey, dating back to the 13th century, then descend to 18 meters below ground to see the chalk caves where the Champagne is aged for a number of years before being sold. Located just around the corner from Veuve Clicquot and Taitttinger is another top Champagne house that offers tours and tastings: GH Martel & Co. This Champagne house also has a medieval chalk quarries, which was dug between the 4th and 15th centuries, and it is open to the public for tours. As you descend into the cellar, at a depth of up to 22 meters, you’ll see their interesting collection of wine-making tools and machinery. Be sure to book your tour ahead of time by contacting the shop via phone or email. I’ve always loved the shape and elegance of the Ruinart Champagne bottle. It’s a work of art and truly expresses the way it should feel to drink a fine Champagne. Visiting the Ruinart cellars in Reims is very much like that bottle. It’s an elegant and luxury experience that you won’t soon forget. At Celliers Ruinart, you’ll be able to do a guided tour of the cellars, which includes some history of the house and the process of champagne making, followed by the tasting of two cuvées: Don Ruinart and one Millesime (rose or blanc de blanc). It’s a fascinating tour for history, art, architecture and wine lovers. The house is one of the oldest and the cellars are up to 40 meters deep, which makes them the deepest in Reims. The entire affair lasts around 2 hours. Tours are conducted in French and English. You can arrange a tour in another language by emailing in advance. The Crayeres Tour – (70€) – “A tour of the Crayères, or chalk quarries, classified as a historical monument in 1931, is a truly unique experience and invitation to discover an atmosphere of silent intimacy reigning in Maison Ruinart’s cellars.” To book, visit their website. Once you’ve visited a few of these top Champagne tours in Reims, you’ll have a much better understanding of how Champagne is made and the history behind the industry and their unique stories. It’s a great way to expand your knowledge of the craft and appreciate it even more than you probably already do. If you have a favorite Champagne house you want to share with our readers, leave us a comment! Like this post? Why not pin it on your Pinterest board to share with others.